Gameplay: This point and click game comes in 2 CDs. A CD does not need to be in the drive to play the game. Nancy will show you the desk in her bedroom. This is where you can access the 'How to be a Detective Book' that shows the game manipulations. The Scrapbook has past Nancy Drew Games information. The Case Files is where the information about the present mystery case is explained. Once you are ready to play the game, click on the plane ticket to go to the new case location. You will then select to play either Junior or Senior detective. The main screen has pictures at the bottom of the page. The bag at left is the inventory link. The journal shows Nancy's notes about the present case. The checklist shows the junior gamer what needs to be done or was done in the case to progress in the game. The gear icon shows the options. Here the voice, effects and music volume can be adjusted. Also, the bottom background can be changed. Closed captioning and screen size selection are also in this page. The Load folder has the list of the saved games that can be replayed. The diskette is used to save the game. The rightmost icon closes the game. Take the phone card from Nancy's desk. Take the wedding invitation with the photo of Kyler and Matt. Start the game by picking up the plane ticket. Nancy flies to Dublin, Ireland to be the Maid of Honor at Kyler Mallory and Matt Simmon's wedding. She talks to Ned on her cell phone while driving at night towards Castle Malloy. As soon as the conversation ends a woman in a flowing white gown crosses the road. Nancy is startled and runs into a ditch just in front of the Castle's gate. This walkthrough has been played on both senior and junior level. Gate: Turn around and go to the gate. Click hold to move Nancy. A blue highlighted area means that it can be interacted with. Click on the gate and see a close up. Take the groom doll on the ground. It has an M signet ring on its neck. Go forward until the castle door. Main door: Use the right door knocker. Talk to the caretaker. He is not very hospitable. Turn around and go back to the gate. At right side of the gate, see a Bailor sign. Click on the sign to automatically go to town. Screaming Banshee: See a phone booth right by the entrance to the Screaming Banshee pub. Go to the door and see a 'No Vacancy' sign. Turn around and forward to automatically go back to the castle. Main door: Go to the front door and look for a way to get inside. Get inside the castle: Click on the door to get a close up. Move cursor to the left and up. See a lit window. Click the up arrow and Nancy say's it must be Kyler. Look down and pick up stones on the ground at left. Take a large stone from the right. Position the stone under the ledge. Click to throw it to the window. Ooops! Kyler goes to the window and points at the door. Go to the main door and knock again. The caretaker is not a happy man. Kyler: Learn that Matt disappeared. Talk to Kyler completely. Matt loves to play practical jokes. Kit Foley, Matt's best friend is here too. Donal Delaney is the caretaker. Donal does not like Matt. Kyler has heard Matt's voice after he disappeared. Nancy shows the groom doll. Donal spends most of his time at the Inn. He believes in banshees, fairies and leprechauns. She hears Matt at the nursery. Learn about Kyler's ancestry and Brendan supposedly being a double agent in the war. Left book case: Check the bookcase close to Kyler. Take the Zodiac Constellation book at left part of the bookcase. Check the helmet at right part of the bookcase. See a gear puzzle on the base drawer of the helmet. There are a total of 9 each of small and large gears. There should be 10 of each. We need 2 more gears. Open the door in between the bookcases. See the destroyed part of the castle. See a dynamo setup left of an unlit lantern at bottom shelf. Hanoi tower dynamo (Junior mode): Move all the rings to the right side of the machine. The rings can only be placed over a larger ring. Think of the rings as 1-5 from the smallest to the largest. Move 1 to the R (right post), 2 to the M (middle post) and 1 to M.
Move 3R, 1L (left post), 2R, 1R, 4M, 1M, 2L, 1L, 3M, 1R, 2M, 1M and 5R. Move 1L, 2R, 1R, 3L, 1M, 2L, 1L and 4R. Move 1R, 2M, 1M and 3R. Move 1L and 2R. Move 1R. The lantern is charged. Take the lit lantern. Hanoi tower dynamo (Senior mode): There are 7 rings to move from left to the right post. Check the solution done by R. Ellison - click here. Desk: Turn right and look at a scale on the table. Look close at the 3 pan scale. It is missing 2 weights. Check the drawer of the desk. See the chart of the weights showing the color, symbols and weights. Check the paper left of the scale explaining binary conversion to letters. Nursery: Enter the first room on the left. Take note of the destroyed and unkempt room. Gems: See a crow take and drop a gem from the wall. Turn left and pick up the orange gem. Place the orange gem back on the wall. Fireplace: Look close at left side of the fireplace. Pick up the broken eyeglasses. Bookcase: Turn right and look close at the bookcase. Check the box at second from top shelf. 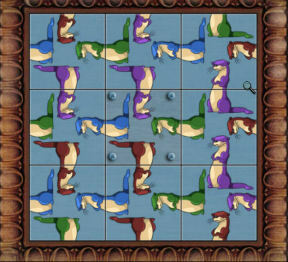 Otter puzzle: See 9 tiles that have depictions of half a body of 4 otters in each tile. There are 4 colors of otters: blue, brown, green and purple. The aim of the puzzle is to have all the otters be complete in body and color. The center tile is permanent. Arrange the 4 tiles adjacent to the central tiles first. Then arrange the 4 corner ones. 1. Turn #4 to complete central blue otter. 2. Move #3 to #2 place. Turn tile in 2 to complete central purple otter. 3. 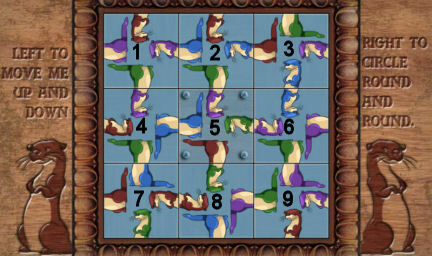 Turn #6 tile to complete central green otter. 4. Move #9 to #8 place. Turn to complete central brown otter. 5. Move #9 to #1 place. Turn to complete side otters. 6. Turn #9 to complete the side otters. 7. Turn #7 to complete side otters. 8. Turn #3 to complete side otters. Hear a sound. Take large gear from the opened drawer. 1. Move #3 to #4 place. Turn tile in 4 to complete central blue otter. 2.Move #1 to #6 place. Turn tile in 6 to complete central green otter. 3. Move #7 to #8 place. Turn tile in 8 to complete central brown otter. 4. Move #1 to #2 place. Turn tile in 2 to complete central purple otter. 5. Move #1 to #7 place. 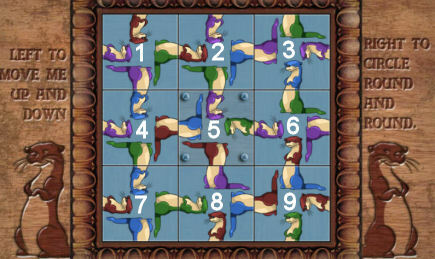 Turn tiles in 1 and 7 to complete side otters. 6. Turn tile in 3 to complete side otters. 9 should be in position. Rocking horse: Turn right, check the horse and rock it. Take the token that falls on the floor. Dollhouse: Turn right and look close at left of the bed. Look close at dollhouse. Dollhouse 1: Read the legend of the colored lines. 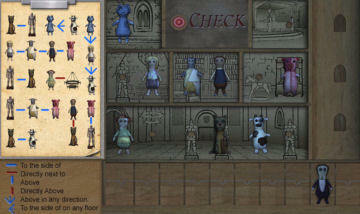 Based on the clues, place the dolls at correct positions on the dollhouse on the right. Side note: If a doll is placed in each room, a star might be earned at the end of the game. Once they are in place, click on the red check button. Take the token. See the token placed in the purse at top left of the screen. There are still 4 missing dolls. Middle floor: none, cat, none, none, none, pig. Bottom floor: none, Kit, none, none, Blonde, none. Dresser: Look close at the LeBleu Lapin (Blue Rabbit) book. Remember the cover of the book. Kyler: Exit the room and go back to Kyler at the library. She wants you to check the printing machine and print 3 more of her invitation. Report to her of your findings. Side note: If important findings are reported to Kyler, a star might be obtained at end of the game. Talk to her again. Learn that Matt stayed in the nursery. His luggage is gone. The castle was destroyed by an explosion caused by Brendan's work on rocket fuel. Exit the library and turn right before the archway of the stairs going up. Main room: Go down the stairs. Look around. Fortune teller: Go forward and check the fortune teller booth right of the main door. See that it needs 3 tokens. Wedding table: Turn right and look close at the wedding table with presents and other items. Take a weight for the scale in the library. Printing press: Pan right and look close at the printing machine right of the work table. Print invitation: See that there is a printing plate now on the left side of the machine. Place K-black ink on the printing plate. Take printing plate #1 at right base of the printer. It has a binary 01000011. Take paper from the right base of the printer and place it on top of the inked plate at left of the machine. Turn the wheel. Take the pressed inked paper. Place the paper over the dryer at right. Press the red button to dry the ink. Place it in wicker basket at right. If a mistake is done, discard the paper in the yellow recycle bin at right. Automatically see the invitation. Nancy notes that Alan Paine is the best man and not Kyle who is Matt's best friend. Do 2 more invitations and place them in the basket at right. Fireplace: Look close at fireplace. Look at the picture of Kyler and Kit on the floor at right of the fireplace. Kit Foley: Pan right to right corner of room and talk to Kit with a black eye. Kit is sure that Matt got cold feet about getting married. Ask why he isn't the best man. He is a real estate developer. He likes the area where the castle sits on. Library: Talk to Kyler at the library about Alan, the best man. She gives Alan's phone number so that Nancy can talk to Alan. Tower: Climb up the stairs at end of the hallway and see that the stairs to the tower is broken. Castle grounds: Exit the castle and look around the grounds. Tower: See lights coming from a room at top of the tower. Garden: Go left from the main door. Click on the garden and enter. Look around. See 7 leprechauns on the ground. They can be turned and have different shaded 4 leaf clover on their shirts. Turn around and look close at the bench. Read the wedding vows written by Kyler. Silo: Go left from garden. See an opening on the ground. Fairy ring: Go left for a bit and then up. Be careful that you don' fall off the cliff. Enter the fairy ring. Celtic crosses: Go right and down to the brown path. Walk going down on the path and see 3 Celtic crosses. Check the dates on the crosses. Note that there is a hole at the center of each cross. See the lit wall back of the crosses. Bog: Go down using the brown path to the south end of the grounds. Go left and see the blue bog. Hear a banshee wailing. Try to cross but you need something to safely do so. Wall: Go to the lit wall right of the main walkway. See that a portion of the wall is active. Exit the grounds and go to the village. Screaming Banshee: Click on the Bailor sign right of the castle gate and automatically be at the village. Telephone: Enter the phone booth at right. Take the receiver. Use the telephone card on the slot. Call your friends if you want to. Call Alan. Learn that Matt and Kit had an argument and that is how Kit got his shiner. Matt and Kyler also argued. Donal Delaney: Enter the Inn. Talk to Donal. He wants his Crow's nest drink before he talks to Nancy. Nancy volunteers to do bartending (mix maid) and help Seamus. Go to the back room and automatically be at the bar. Listen to the instructions by Seamus. 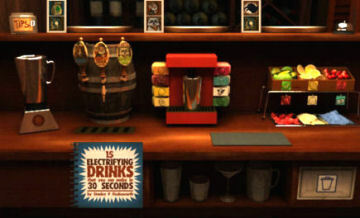 Mix drinks: The ticket in picture form is placed on the top of the bar. There will be 2 drinks per ticket. The recipes to mix the drinks are found in the book at bottom left. The drinks are made by placing the silver mixing glass under the juicer or the beer tap. 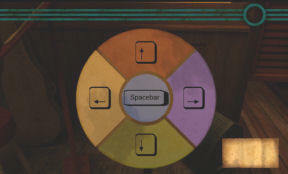 Then press the appropriate item's button as many times as the book says. If the mix needed to be blended, a picture of the blender is seen in the book. Place the solid ingredients first in the blender and then press the blender button. Place the serving glass on the gray mat and pour the mixed-blended drink on it. Place the drinks on the plate beside the ticket on top of the bar. After doing the 2 drinks in the ticket closest to the bell, press the bell. If a mistake is done discard the drink at the rubbish bin at bottom right. Do the mixing fast and proper and get more tips. If you mix drinks at different times, you might get a star at end of the game. When done, automatically talk to Donal. Learn that his explanation for what happened to Matt and to Brendan's family, Caitlin and Fiona is the good people. Nancy's car keys are gone and the good people have taken a liking to her. A wailing of a Banshee means a death in the family. He says that Kit is in love with Kyler. Make more tokens or coins: Go back and make more drinks to get more money to use on the fortune teller machine back in the castle, for the games here or for the fun of it. You can also get tokens winning the games here at the Inn. 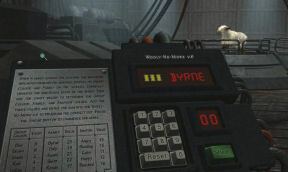 Game machines: Go right of Donal and play the game machines to get items needed in the game. Difference Detective: Senior and junior differ in the puzzles shown. Look close at the procedure plate to learn the how to. Click on the token slot to start the game. Save the game so that you can replay to win and not lose money or you have to make more coins. Take the whistle when you win. Any additional wins will get more tokens. If you win all difference game, you will get a star at end of the game. Darts Away: Look close at the procedure plate. Click on the token slot to start the game. Save game so that you don't lose money when replay is needed. Study well how many points are obtained when an area is hit. The object of the game is to get 000 after using all the darts. The scoring is a subtraction from the initial points seen at top right by the points of a hit area. Red bulls eye = 50, Green bulls eye = 25, Inner ring = number hit x3, Outer ring = number hit x2, Black or white areas = the number hit. It is best to hit areas that have a higher score first and then hit the lower score areas close to the end. Hit outside for zero points. Take the blue dog doll as prize. Get 4 bulls eyes to get a score of 200. Throw the following darts off the board to get 0 score except the last one. Use the last dart to hit the 1 slot to get a score of 201. Back out and get a greenish egg. Castle: Go back to the castle. Fortune Telling machine: Now that you have tokens, get your fortune told. Click on the slot to automatically insert 3 tokens on the machine right of the door. Take a wood weight from the bin. We now have the 2 weights missing from the scale in the library. Read your fortune on the paper under the weight. If you get your fortune told a lot of times, you will get a star at end of the game. Kit: Turn around. Go and talk to Kit again about his shiner. He wants you to make the sitting arrangement. Sitting Arrangement: Senior and junior game differ in clues given but the solution is the same. Look at the paper in inventory. Follow the clues given and seat the guests. No significant acknowledgement if it is correct. Show it to Kit and he will say if it is correct. He gives a Brehon Law book found in Matt's room. Check the book and see it is the Leprechaun's level of society. Take note that there are different shaded shamrocks depicted above each level of society. Library: Go upstairs to the library. Kyler: Talk to Kyler about the argument. Desk: Go to the desk at end of the room. Look close at the scale. 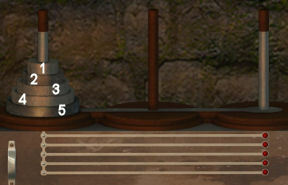 Scale puzzle: The aim of the puzzle is to place all the weights on the 3 scales and have them all balanced. Take the graph in the drawer to use as clues in calculating and placing of the weights. The secret drawer opens. Take the stone tile. Castle grounds: Exit the castle. Garden: Go left from the main door and enter the gardens. Note that Nancy changed her clothes. Leprechauns: Look close at the leprechauns. The shamrock on their chest looks familiar. Check the book found in the nursery by Kit. Note that the leprechauns' shamrocks are similar to that in the book. Each of the paragraph starts with an elaborate first letter. Turn the leprechauns based on the shamrocks. F = forward facing, R = face right, L = face left and B = back is turned. L-R: R, L, B, F, R, B and F.
Take the Kyler doll, token and the blue, green and red gems from the bird's nest. Gate: Go to the gate by the road. Tiles slider: Click to look close at the gate. See a panel on the right that has tiles. 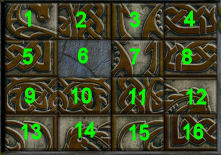 The numbers are the positions of the tile. Click on the tile that is in the numbered place. Pull back resets the puzzle. Junior level: This is one of the possible solutions. Senior level: This is one of the possible solutions. It looks like a piece is missing. Place the stone tile taken from the drawer of the Scale puzzle in the library. 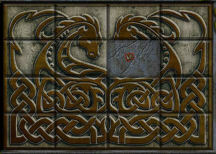 Take plate 2 from the slot above the dragon puzzle. It has binary 01001101. Kit: Talk to Kit again. Nursery: Now that we have all the gems that the bird stole, let's check the gem panel. Gem panel: Place the 3 gems taken from the bird's nest in the garden on the gem panel on the wall. The aim of the puzzle is to press the gems in the correct order. 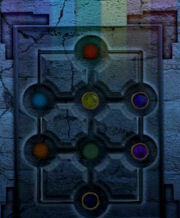 The clue is seen above the panel - the color of the rainbow. Click the colors in the sequence starting from right going left: red, orange, yellow, green, light blue, indigo blue and purple. No need to press the black button. See the fireplace opens to a hidden room. Fireplace hidden room: Enter the fireplace. Turn right and take the board from the floor. That will come handy. Turn around and take the stone marker code from the floor. See the crow flies towards you. Then, then see... a screaming banshee. Bog: Time to check that area now that we have a board that can help us cross the first part. 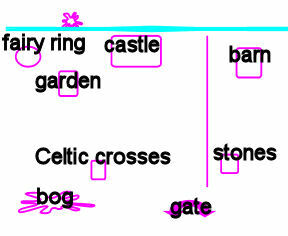 Bog maze: Go to the left south boundary of the castle grounds. Place the board taken from the fireplace hidden room on the water. Cross to the other side. See the first set of stone markers. Study the stone marker code paper taken from the hidden room. Follow the marker's code even though you see another stone marker before finishing the code. Once the previous code is done, follow the stone marker seen on the location of the end of the previous instructions. The others in between are to throw you off. Forward 1x, right 1x, forward 2xs, right 2xs, forward 2xs, left 4xs, back 2xs, left 2xs, back 3xs, left 2xs, forward 1x, left 1x, forward 2xs, right 1x, forward 2xs, right 2xs, forward 2xs, right 1x, forward 1x. See the bog hut. No more mazes after this. Automatically get here or exit back to the castle grounds. Bog hut: Enter the hut. Wicker basket: Look diagonal right and see a wicker basket. Open the basket and take the jetpack. Sewing worktable: Look close at the work table right of the bird cage. Take dollhouse code 2 from the table. See a doll being made. Check the box at right that needs a key. It has an ornate design on the front just like the one on the nursery door. Bird cage: Look close and see swarm of flies. There's something on the floor of the bird cage. Herb and remedies worktable: Look close at the herb table on the left. Read the book and see the different herbs and where they can be found. The back pages are remedies. Bug Bane: Check the Bug Bane recipe. We can get rid of these pesky flies. Mix one part each of tansy, pennyroyal, wormwood, catnip and thyme on the mortar and pestle. Click the pestle to grind it. Take the powdered Bug bane. Bird cage: Use Bug Bane on the birdcage. It works. Take the lens. Exit the hut and go forward. Castle grounds: Automatically be at the castle grounds. Screaming Banshee: Click on the Bailor sign right of the castle gate. Enter the Inn. Talk to Donal and learn about an old gypsy woman that lives in the bog. Go back to the castle. Celtic crosses: From the path of the castle, go left until you see a path. Take the path going down and see the crosses on the right. Look close and see the 3 dates on the crosses: 1801, 1916 and 1845. Take note of the lit wall at other side of the grounds behind the crosses. Place the lens taken from the hut at the center of each of the crosses. Look close through the lens. See a pattern through the lens. Back up and automatically take the lens. The lens is focused on the symbols on the wall. 1801 = ornate triangle, 1916 = diamond with a zigzag line underneath and 1845 = like sound waves. Wall: Go to the wall at other side of the path. Look close at the left side wall that is active. Press the symbols seen through the lens when attached on the Celtic crosses. Start with the oldest cross' symbol - 1801, then the symbol of 1845 and then 1916. Wow - see the wall go down. Pasture: Go through the lowered wall. See flock of sheep grazing in this area. Standing stones: Follow the path that goes to the right and then down. See 4 standing stones. Each stone is made of 3 blocks one on top of each other. The top has constellations, middle has trees and bottom has Ogam scripts. Broken wall: Exit the standing stones and go back to the brown path. Go up and then take the lower path going to the right. At the end is an active area. Enter the area and pick up the paper on the rock. It is a real estate plan of Castle Malloy grounds with condo's and golf course. It seems like Kit Foley has plans for the property already. A crow voiced his opinion. Barn: Turn around and take the path until the end close to the left wall. Take the higher path going to the right and up. Take the next right and see the barn. Enter and see an elaborate shearing machine - Wooly no more. Check the control panel on the left. Exit and take the small gear hanging from the wind chime. Now we have all the gears for the gear puzzle in the library. Kit: Talk to Kit about the sketch and the bog. Library: Go upstairs to the library and talk to Kyler. Kyler: Talk to Kyler about Kit's real estate doodling. She wants Nancy to collect herbs for her wedding bouquet to counteract the forces that might be at work. She gives the list of herbs and basket. Gear puzzle: Go to the bookcase close to Tyler. Look close at the helmet. Open the drawer at the base. Now that you have collected the 2 missing gears, it is time place the gears. 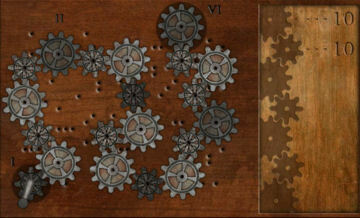 The aim of the puzzle is to place the gears from I to II ending at VI and get all of them to rotate. Turn the handle in gear I to see if the attached gears rotate. When done correctly, the helmet spits out dollhouse code 3. Nursery: Go to the nursery and look close at dollhouse. Automatically, dollhouse code 2 and 3 are placed on the left. 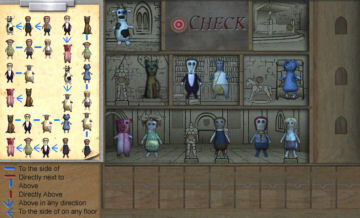 The dolls collected from the garden and the dart game are also placed on the rack at the bottom of the screen. There are still 2 missing dolls. 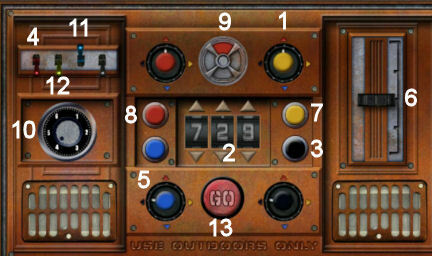 Dollhouse 2: The code for this puzzle is the one from the bog hut. Read the legend of the colored lines. Middle floor: none, none, none, cow, Kit, none. Bottom floor: Blonde, none, pig, none, dog, none. Dollhouse 3: See from the code that we are missing a sheep doll. It might be the doll being made at the bog hut. Bog house: Go back to the bog house. Herb book: Check the herb book on the worktable at left. Learn where all the herbs and flowers that Kyler wants can be found. Take the sage hanging above the herbs. Doll worktable: Click the unfinished doll on the worktable. It needs stuffing. Check the wool bin and Nancy says she needs more wool. Exit the hut and the bog. The sage is already taken from the bog hut. Foxglove: Look at the entrance to the bog. Take pink foxglove this side of the water. Roses: Take the path from the bog and go up to the garden. Enter and face the leprechaun. Turn around and take red roses. Yarrow: Go left and follow the path to go up and left to the fairy ring. Enter the fairy ring and take yellow yarrow. Lavender: Go to the standing stone at the sheep pasture area. Enter the ring of standing stones. Turn to the standing stone twice. Look down at the base and take lavender. Vervain: Go to the castle gate. Look close and click to the left side to the archway. Larkspur: Exit to the road. Go left to the end of the road. Take some blue larkspur from the ground. Kyler: Go back to the castle and let's give the bouquet to Kyler before they wilt. Go to the library. Hear Kit and Kyler quarreling. Once the conversation becomes muffled go down to the main hall. Kit: Check under the bed of the far cot and see Matt's lost luggage. Exit the castle and then go back in again. Talk to Kit about Matt's luggage and the discussion in the library. Kyler: Go back upstairs. Talk to Kyler and also give her the flowers. Donal: Talk to Donal about the stone pillars. He has a book about Ogam runes. He doesn't feel like answering some question because the band is missing a drummer and he is missing his music. Nancy volunteers to play the drums. Ugh. Drum puzzle: Seamus explains how to play the drums. Watch the cue above that moves to the right. When the cue or colored ball hits the drum or circle at the end, hit the corresponding color on the drum at the center. Check the timing, the ball might react a bit slower or ahead of the hole-drum before it can be counted as a score. When a wrong colored ball is hit over the circle at the end, the score is subtracted by one point. It is best to skip the ball if not sure that it will get over the drum. A ball counted as correct hit disappears over the drum. I recommend using the keyboard arrows for the outside colors and the space bar for the center gray one. The puzzle is forgiving and will accept a low score, if you replay continuously. When the drum puzzle is done, take the Ancient Celtic Sabbats - Ogham book. Talk to Donal again. He is the one that placed Matt's suitcase under cot. He gives a key to the sheep pen. He wants Nancy to bring the sheep in for shearing tomorrow. There are 10 sheep. Blow a whistle to collect all 10, go to the barn and lock the barn. Castle grounds: Go back to the castle. Pasture: Go to the right side of the grounds and start collecting the sheep. See a sheep count at top left of the page beside the whistle won at the Difference game. Look for sheep. 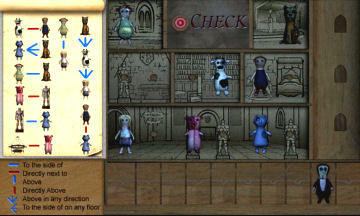 Once seen within the circle of light, blow the whistle by clicking on the whistle icon at top left of the screen and they will go to the barn. If you are slow, the sheep will come out of the barn and the count goes down. Take note of where you hear them baaa bleat and go there immediately. They usually gather at north east of the pasture or south of the barn. Good luck. When there are less sheep seen, I saved my game and look for the sheep, replay and then go to the place where I saw them and whistle. Once the count is 10, immediately enter the barn, listen to them bleat and then exit. The door will automatically lock and Nancy will note that it's all locked up. If the door is not automatically locked, the sheep count is not 10 and one or 2 left. Standing stone: Go to the standing stones at bottom part of the pasture. The 4 standings stones are made up of 3 stones one on top of another. 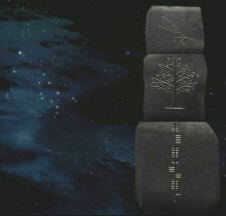 Click on each of the 3 stones and see that they rotate to show 4 different etched Ogham script, tree or constellation. 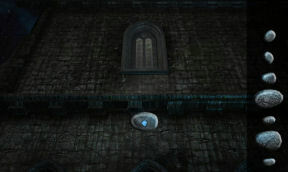 In front of the first stone is an ornate disk on the ground. Ogham runes: The bottom stones have Ogham runes. Read the Ancient Celtic Sabbats book given by Donal. Learn about the 4 festivals: Samhain, Imbolc, Beltaine and Lugnasa. Learn that Ogham scripts are made up of 20 letters. They are read in stone markers from bottom to top. Note down or remember the first 2 Ogham of each of the festivals: BE for Beltaine, LU for Lugnasa, SA for Samhain and IM for Imbolc. Trees: Click on the middle stone to see the different depictions of trees: winter - no leaves, spring - new leaves, summer - full of leaves and fall - falling leaves. Constellation: Turn the stones on top and see 4 different constellations. Using the Zodiac Constellation book taken from the library, identify what those constellations are. They are Taurus, Leo, Scorpio and Aquarius. Check the constellation dates: Taurus is May 15-June 20 (summer), Leo is from August 11-September 16 (fall), Scorpius is from November 24-November 30 (winter) and Aquarius is from February 17-March 11 (spring). Arrange the standing stones: Now that we have identified all the etchings on the stones, turn the stones to show the appropriate information. Look at the first stone. The wedding is 3 days from now on June 1. So it is summer. The constellation seen in the sky left of the stone is Taurus. Going clockwise with the first stone being Beltaine. Look at the last 2 runes on the stones to know which stone is for what festival. The first letter being the one at the bottom. Find out that the first stone seen when the ring is entered is Beltaine. Going clockwise or to the right: Lugnasa, Samhain and Imbolc. If correctly done, the ornate stone below the first stone opens. Take printing plate #3 with binary 01011001. Donal: Talk to Donal about the shearing sheep. He allowed Nancy to shear if she fills 3 bags. Donal hums a tune that calls the sheep to be sheared. Barn: Go to the barn in the pasture. Shear sheep: Enter the barn. Read the plaque on the left side of the Wooly-No-More v.6 machine. There are 3 information needed to calculate the total value. 1. The group color that is shown by the color of the asterisk on the monitor. 2. The family name of the sheep. 3. The emotion of the sheep. Add the values of the 3 criteria and enter it on the keypad. Then press the shear button. 1. Pull back from control panel and see the shearing pad. Call a sheep by clicking on the whistle. The sheep comes in and walks at the shearing pad. 2. On the machine check the color of the asterisk before the name. Note the value on the chart on the left. 3. See the family name of the sheep. Note the value on the chart on the left. 4. Look at the sheep and gauge its emotion: angry (head shaking up and down and one hoof moving), bleating, calm (motionless), happy (hopping up and down) and panicked (shaking and continuous motion). Note the value on the chart on the left. 5. Add the values and enter it on the keypad. 6. Press the shear button. If correct, see the nice do of the sheep. Check the machine at right of the pad after every 2 correct shearing to see if the bag is full. Fill 3 bags for Dolan. Take wool from the last bag. Note: If you shear sheep several times and get new looks, you might get a star at the end of the game. Bog Hut: Go to the bog. Enter the hut and go to the doll worktable. Doll: Use the wool on the unfinished sheep doll. Kit: Talk to Kit about Matt's luggage. Nursery: Go to the nursery. Dollhouse 3: Now that the sheep doll is taken, do the dollhouse puzzle taken from the gear puzzle. Take printing plate #4 from the drawer. It has binary 01001011. Middle floor: none, Blonde, sheep, Kit, none, pig. Bottom floor: Kyler, none, none, cat, cow, none. Library: Go to the desk at the back of the library. Study the paper left of the scale. It explains how to change the binary into a letter. 1. Use the example graph on the right to get the value of the binary. The 1 is given a value depending on its position in the binary. Add the values obtained to get the total value of the binary. 2. Using the graph on the top, change the total value of the binary to a letter. 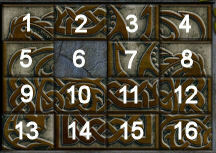 Plate from press 01000011 with total value of 67 is letter C.
Plate from the gate's dragon puzzle 01001101 with total value of 77 is letter M.
Plate taken from the standing stone puzzle 01011001 with total value of 89 is letter Y. Plate taken from dollhouse puzzle 01001011 with total value of 75 is letter K.
Main Hall: Go down and go to the printing press. 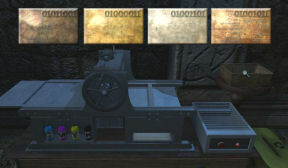 Print the 4 printing plates: There are 4 printing plates collected from different places and puzzles. Each printing plate has a binary on top right corner. We now know the letters that correspond to the binaries. There are 4 colors at the printing press: Y, C, M and K. The printing plate binaries are the colors to use for that particular plate. Click on the printing press and see the 4 printing plates on the screen. 1. Place the printing plate on the left of the machine. The printing plate that went in first is the 01011001 . 2. Place the color that corresponds to that printing plate. 3. Place a paper over the inked plate. 4. Turn the wheel to press the inked paper. 5. Take the inked paper and place it on the dryer at right. Do not turn the dryer on. This is just to have a place to hold that paper. 6. Place the next plate on the left. 7. Place ink for that particular plate. 8. Take the inked paper that you previously did with the first plate and lay it over the new inked plate. 9. Turn the wheel to press that new color on to the paper. 10. Take the inked paper and place it on the dryer without turning it on. 11. Do the above for the next two plates with their corresponding colors. 12 After pressing the 4 plates with 4 different colors, place it on the dryer. Turn on the dryer. Take the finished printed paper and read it. It is the instruction for the jetpack taken from the bog hut's wicker basket. If the colors printed are wrong, the instructions will also be wrong. Note: If you print multicolored papers using the 4 plates, you might get a star at the end of the game. Castle grounds: Exit the castle, go to the grounds and try out the jet pack. Let's fly: Look close at the jetpack taken from the bog hut in inventory. See the panel of the jetpack. 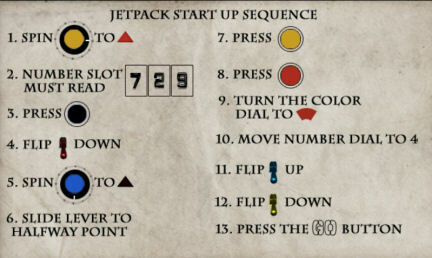 Follow the newly printed instruction on how to start the jetpack. Save the game just in case. Refer to the instructions in inventory for each step. The numbers on the graphic below are the steps in the instruction. Note: If you use the jetpack several times, you might get a star at the end of the game. Tower: Go to the tower where lights were seen. Enter through the window. Look around at the well taken care of room. Coffee table: Go to the table at right beside the 2 chairs. Open the drawer and take the paper with a list of 4 books. Desk: Go to the desk left of the bed. Look close at the family tree. See the change in surname of John Mallory, Kyler's father. The ones with asterisks are dead. 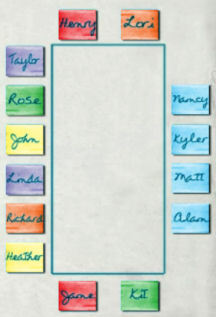 Some of those that passed away are not marked with asterisk like John, Kyler's father. Look at the dial lock of the desk. It looks familiar. Like on the cover of the Le Bleu Lapin - Blue Rabbit book in the nursery. Enter LAPIN and let's see if it will open. It didn't open but dollhouse code 4 is obtained. Find the island: Let's find the island in the drawing. Fly to the left. Pass the garden and then up to go to the ocean. See and land on the island. Go forward and look at the N5 etched on the rock. Fly south to be back on the land. If you want to fly around - have fun. To land, click on the main door of the castle. Castle: Go up to the library. Book shelf beside Kyler: Take the Hydroponics and Aeroponics book from top shelf behind the horse. Book shelf beside the desk: Take the Ersatz Quidnuncs from left top shelf and the Nautical Cartography from top right shelf. Desk: Take the Zoopraxiscope book from the desk. Tower desk code: The paper from the coffee table has the picture of the desk lock. The desk lock needs 5 letters. 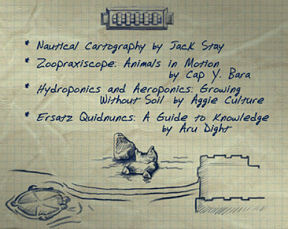 There are 4 books in the list and the drawing of the island with the N5 etched on it. Each of the 4 books has inscription on the inside cover. These are the clues to the letter. Based on the etching on the rock in the island, one of the letters is N and it is in the 5th position. Nautical Cartography: To our dear friend: One year soon you'll finally join us here. The seas await your notice. Take note of 'one' and 'seas'. The first letter is C.
Zoopraxiscope: Animals abound, in a merry round. Seated in the middle, can answer the riddle. On legs of four, they spin ever more. The X is the middle letter of Zoopraxiscope and there is a mention of 'four. The fourth letter is X.
Hydroponics and Aeroponics: Growing without Soil - Three years into the study. By removing all the duplicates, I find that the only remaining true consonant is key. The last consonant in the title is L and it mentions 3 years. Ersatz Quidnuncs: When the 13 instructions on the riddle is completed, there is a set of letters that should be read aloud to make sense. I gathered on the last 8 letters to be read Q only or Q will do. This clue refers to the second letter of the code - Q. The desk lock code is: C Q L X N.
Tower: See the screaming banshee come out of the tower window and fly away. Move forward to the grounds and automatically use the jet pack. Fly to the tower. Enter through the window. Desk: Enter the code: C Q L X N. The desk opens. See Fiona's picture. Take the key with the nursery and the bog hut's box design. Read Cailyn's diary and learn about the daily life of her family, Brendan and Fiona. Fiona has her own jetpack. The destroyed part of the castle beside the library is the false laboratory. Take the Nancy doll that has her car key on the neck. Exit the tower. Castle: Go up to the Nursery. Dollhouse 4 (optional): The Nancy doll completes the dollhouse. 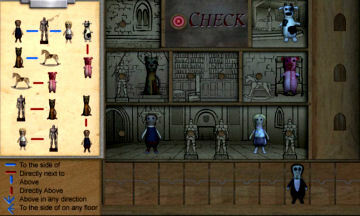 Based on the dollhouse code from the desk at the tower, place the dolls at correct positions on the dollhouse on the right. Take the blue Easter Egg. Middle floor: none, cat, Matt, sheep, none, dog. Bottom floor: pig, Kyler, none, Kit, Nancy, Blonde. Fly to the bog and click on the water to be outside the hut. Bog hut: Enter and the hut. Look close at the doll work desk. Use the key from the tower desk on the box with the same design as the nursery door and the key. Open the box. Look at the card in the box. Pull back from the table. Meet the screaming banshee who we now know the identity of. How sad. Secret Laboratory: Nancy is pushed down into a pit. Nancy walks the tunnel. Entrance: Look at the lever right of the entryway. Pull down the lever. Ooops! Matt: Meet Matt. Learn what happened to him and information about the secret lab. Desk: Go right and check the desk. Read the work log (rocket notes) and learn about Brendan's experiment. Take note of the color codes on the second page: yellow-gray, red-purple, light brown-dark brown, blue-black, pink-green. Learn there is propellant already installed in the rocket. Remember the launch controller preparation steps: Insert safety key, flip first switch to check continuity. Green light indicates correct wire connection. Arm the rocket with second switch. Flip third switch to launch. Button: Take the clipboard hanging on the wall left of the poster. See a button 'in case of lockdown, press to open'. Press the button. Chemical's clean room: See a chemical storage clean room. There is a key at the back of the room. We have to remove all the chemicals in the way. There storage bins for 1, 2 and 3. Periodic table: Study the poster above the desk. See what chemicals can be stored together. Category 1: NH3, P, Na, K, Al and H.
Category 2: Ag, H2O, Cl, LOX, C and I. Category 3: F, Ab, Hg, Br, Rn and Cs. Store the chemicals: Look close at the clean room and see the chemicals, large and small container. There are 3 storage bins for category 1, 2 and 3 chemicals. Use the claw hand to pick up the chemical and move it inside the appropriate storage bin and drop it in there. To move the claw, use the directional arrows at right. To pick up the chemicals, open the claw wider than the size of the chemical. The claw has an inner hook that circles the chemical and the outer clamp. Move the inner hook of the claw as close to the chemical and then close the clamp. Use the graph line to center the clamp, gauge the size to open the clamp and the inner hook. Move the chemical and place it inside the appropriate storage bin. Open the claw to release the chemical inside the storage bin. Do the right side chemicals first to clear space for access to category 2 and then category 3. There are second chances and they start at the end of the last chemical. Good luck. Chalkboard: Study the chalkboard on the wall beside the control panel. Note the side view. The angle of the rocket is 90.1. There are 3 types of fins. Rocket: Go to the room in the middle and check the rocket. It is dark but the room lights up when you get close. Nosecone: Climb the ladder and see that it is missing a cone. Look around for it. Go to the sink area and see the nose cone on a top shelf. The ladder has no rungs. 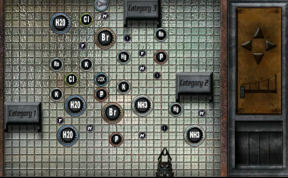 Ladder: Click on the ladder with no rungs and get a close up of the puzzle. 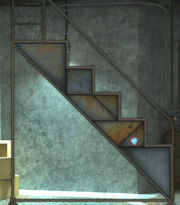 Place the geometric shaped plates on the left to make steps for the ladder. Right click to rotate the pieces. Click them in place. Climb up and get the nosecone. Place the nosecone on top of the rocket. Fins: Look at the base of the rocket and see that there are no fins attached. Go back to the sink area. Check the buckets under the table. There are 3 kinds of fins. Take the fins in the middle bucket. It is red with a white circle. Place the fins at the base of the rocket. Wiring: Open the box at the base of the rocket launcher. See the wires are tangled. yellow-gray, red-purple, orange-brown, blue-black, green-pink. Follow the numbered end to the colored circle at right to know what color it is. Then insert it to the appropriate circle on the left. Wire 1 to 4th from top red circle at left. Wire 2 to second from top blue circle at left. Wire 3 to third from top orange circle at left. Wire 4 to top yellow circle at left. Wire 5 to bottom green circle at left. Blast off: Do the launch preparation stated in the last page of the work log. Look close at the control stand left of the chalkboard. 1. Insert the hard won safety key taken from the clean room on the keyhole at right. 2. Turn the dial to 90.1. The angle of the rocket seen on the chalkboard. 3. Flip the left switch to see if it has green light. If the light is still red, the wiring on the base of the rocket was done wrong. 4. Flip the middle switch to arm the rocket. 5. Flip the right switch to launch the rocket. 3 2 1 Blast off! See you in Bahamas at Ransom of the Seven Ship! Watch the outtakes at end of the credits.